The human skeleton consists of 206 bones. The largest bone in the body is the femur and the smallest is the stapes. 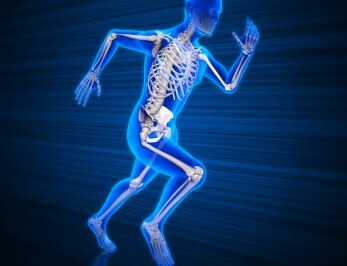 The skeletal system is one of the most important systems of the human body. It comprises not only bones but cartilages, muscles and joints. The ligaments connect bones to other bones. Tendons connect muscles to bones. Cartilage is a tough elastic fibrous tissue found in the joints and other parts of the body. A joint is the union of two or more bones of the skeleton. There are many differences between the male and female human skeletons. The most prominent of these differences is the pelvis, which in women is flatter, more rounded and proportionally larger to allow for childbirth. Skeletal disorders can include bone cysts, spurs or tumors, osteoarthritis, osteoporosis, osteosarcoma, osteomyelitis, metabolic bone disease and others. The medical specialty that is usually involved with the bones and injuries to the bones is orthopedics.